Planes have been landing and taking off at what is now Elstree Aerodrome since the 1930’s. During World War II the airfield was used as a facility for repairing damaged RAF planes, and in decades it has become increasingly popular as a base for both fixed wing planes and helicopters. This has inevitably led to complaints in regard to noise from residents in nearby communities, particularly those served by the Radlett Society in Radlett and Aldenham. 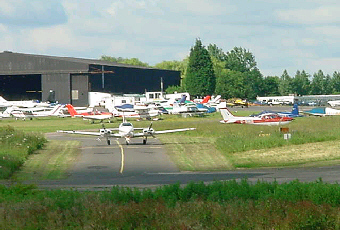 The Radlett Society and Green Belt Association is one of a number of bodies that have representatives on the Aerodrome Consultative Committee. This has regular meetings with the airfield owners and operators to monitor operations and to represent the interests of the public. As a result of pressure from this Committee the airfield now imposes a protocol on pilots that is intended to reduce the nuisance from aircraft and helicopter movements. Under the agreed protocol fixed-wing planes arriving from other destinations are no longer allowed to join the circuit either to the North or South of the field. They are required to fly ‘straight-in’ from points 4 miles to the East or West. Departing fixed- wing aircraft are similarly required to fly well clear of the field before heading for their destinations. This has the effect of dispersing many aircraft movements away from Radlett. Fixed-wing aircraft in use for pilot training continue to use a circuit over Radlett, but now have to take one of three paths – inner, middle, or outer. The inner path, takes planes over New Road, Loom Lane, and The Ridgeway. The middle path takes planes over Watford Road, Station Road, and Newberries Avenue. The outer path takes planes over the Northern fringes of Radlett such as Oakridge Avenue, the Warren, and Porters Park Golf Course. Use of each path is limited to one hour at a time to minimise nuisance in any one area. Helicopters operate under a different protocol. Training is carried out in circuits close the field, whilst arriving and departing aircraft are required to follow one of three designated routes that are intended to keep them clear of residential housing. Of course pilots cannot always keep rigidly to the designated routes: wind and other factors can easily result in aircraft being off-course. Further, engine noise can always be heard over a corridor much wider than the designated routes. However it is now acknowledged that current arrangements have contributed to a noticeably reduction in noise over Radlett since the protocols were introduced. Residents who feel they have a genuine complaint about either fixed-wing aircraft of helicopters can phone the control tower on 020 8593 7480. If the tower is busy a message can be left on 020 8905 2138, or by fax on 020 8207 3691. Quoting a time, a location, and if possible the last two letters of the aircraft registration will always assist in identifying errant pilots. All complaints are logged and given a reference number for subsequent review by the airfield authorities, and the Aerodrome Consultative Committee. Callers are reminded to be polite, and to respect the fact that the person they speak to may also be talking to aircraft on the ground and in the air.